Celebrating the Strengths of Black Youth (CSBY) was developed by 3C Institute with grants from the National Institute of Child Health and Human Development. CSBY has been proven effective at boosting African American children's self-esteem and facilitating productive parent-child conversations about race. Celebrating the Strengths of Black Youth (CSBY) is based on years of research and extensive input from the African American community. 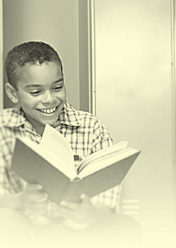 A research study exploring the impact of the CSBY program on African American children's self-esteem, racial identity, and parent-child communication revealed that after the intervention, parents were much more likely to communicate messages of racial equality, and children had higher levels of self-esteem. Decades of research has linked African American youths' high self-esteem and positive racial identity with their academic success, behavioral adjustment, and positive emotional functioning (Chavous et al., 2008; Smith et al., 2009). Chavous, T. M., Rivas-Drake, D., Smalls, C., Griffin, T., & Cogburn, C. (2008). Gender matters, too: The influences of school racial discrimination and racial identity on academic engagement outcomes among African American adolescents. Developmental Psychology, 44, 637-654. Smith, C. O., Levine, D. W., Smith, E. P., Dumas, J., & Prinz, R. J. (2009). A developmental perspective of the relationship of racial-ethic identity to self-construct, achievement, and behavior in African American children. Cultural Diversity and Ethnic Minority Psychology, 15, 145-157.